Today I happened to be partaking in some internet window shopping (or browser shopping as I like to call it)...something that I enjoy doing from time to time just so that I can drool and dream about the myriad of 'cool' merchandise I either can't afford or fit into my ever shrinking budget. One of the stops along my browser shopping route was Best Buy Canada's website. On the main page, I spotted an interesting promotion involving Nintendo products. 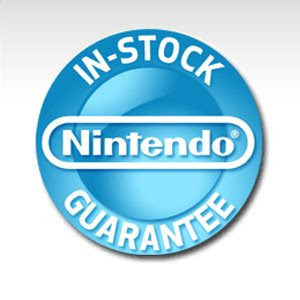 The promotion is a Nintendo in-stock guarantee. Either way, this ultimately becomes a win-win situation for the consumer. High demand Nintendo products available for purchase online and if not, get $10 to spend online at BestBuy.ca. For more details on this promotion, visit the BestBuy.ca website. That's a pretty slick guarantee logo up there. It's got sheen.